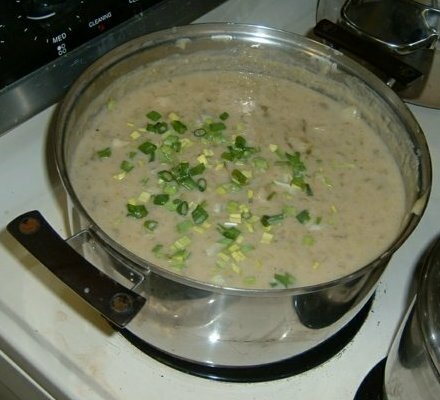 Potato Leek Soup is wonderful during cold weather, served hot, or during hot weather, served chilled. A bit of San Francisco sourdough bread is a perfect accompaniment. Put olive oil in microwaveable bowl, add cilantro and garlic, crumble dried spices into bowl. Cook 30 seconds at 100. Add half of the green onion to bowl, cook 1 minute at 100. Reserve other half for garnish. Add yellow onion, cook 2 minutes at 100. Add leeks, cook 5 minutes at 100. Microwave 4C water and bouillon cubes for 8 - 10 minutes at 100. Pour broth into 7Qt stew pot, put on stove, put burner on High and heat for a couple minutes. Add oatmeal, and vegetables and spices mixture, to stew pot, stir well. Add potatoes and milk to pot, stir well. Add enough water to pot, to bring level to a couple inches below top of pot. Bring up heat to simmer, turn down to slow simmer. Cook 30 - 45 minutes, until vegetables are tender and soup thickens. Make sure potatoes are very soft. Longer is better. Leeks are a root vegetable like green onions. Unlike the green onion, they gather a lot of dirt inside the root. You must clean them very thoroughly. Nothing kills good soup more than gritty taste (however well cooked). Google for "leeks laxative", if you don't understand the consequences. Trim the root (hairy end), and trim the top, keeping an inch or so of the green leafy leek. Save the remainder for other soups, or cooking in general. Slice the leek lengthwise, in half. Hold the half in your hand so it doesn't separate, agitate in a large pan of water for a good 30 seconds to wash all dirt out of the root. Don't be in a hurry here, clean well. Repeat for each half. Drain the pan. Wash all dirt out of the pan, refill with water, and repeat cleaning until the pan drains totally clean. Let the leek halves drain well, slice as thin as you can vertically, then chop horizontally. With most soups and stews, and this recipe is no exception, the flavour is intensified from sitting overnight, in a well sealed refrigerator container, after cooking. But be prepared. The oatmeal in this recipe will continue to soak up fluids, even when refrigerated. So if you prepare potato leek soup, and plan to serve it the next day, have a couple extra bouillon cubes ready. Make a couple cups extra broth, before warming the soup for serving. If the soup has turned into stew, or aspic even, warm it slowly and add 1/2 cup of broth, or even more, until it becomes a soup again. The flavour will be perfect, and the consistency will make the extra effort worthwhile. Do not throw out the green leafy portion of the leek - it's all good. It makes an perfect substitute for onion in any recipe. Properly diced, it works quite well in Couscous Salad, or Tabouilli, for instance. Peel and cube the eggplant, 1/2" cubes. Mix eggplant, onion, garlic, basil, spaghetti sauce. Open bottle of red wine (cab is good), let it breathe, test it well. Cook eggplant mixture in microwave - 5 minutes @ 100%, then 30 minutes @ 30%. Remove from microwave, add red wine. Serve ratatouille over rice, with some sourdough bread, and more red wine. Warm eggs to room temperature. Separate eggs, religiously keeping any egg yolk out of the egg whites. I separate each egg into an empty cup, examine the white carefully, and ever so gently deposit the yolk in another cup. If the yolk sits, unbroken, in another cup, then it's likely that the white is clean. If the yolk breaks when deposited, then I set the white aside, and only use that one if I run out of eggs. Beat / blend egg whites, until stiff and they form peaks. Fold in sugar, vanilla, and nuts / chocolate chips. Drop egg mixture using a very clean teaspoon, onto a very clean cookie sheet. The cookies will not expand, so you can put them on the sheet as closely as necessary. Each cookie should be about one teaspoon of cookie batter. One batch = one 11" x 16" cookie sheet. For best results, plan that all cookies are directly exposed to the heating elements in the oven. Only use one shelf in the oven, and place cookie sheets side by side, as best possible. Two 11" x 16" cookie sheets just barely fit beside each other, in a 16" deep oven. Put the cookies into the oven, as soon as possible after putting them on the sheet. If necessary, turn the oven temperature up, until it lights again. This is very important. Leave the oven on for 5 minutes - no more - then turn the oven off. If you catch any odor of burning, turn the oven off immediately, but do not despair, and do not open the oven door. Leave the cookies in the oven, and do not open the door, 4 hours to overnight. 8 to 12 hours is not too long, noting that you have turned the oven off. The cookies dry (harden) slowly - meringue bakes very gradually. If time is short, you can accelerate the drying of the cookies. A couple hours before you are scheduled to remove them from the oven, turn the oven back on, and bring the temperature up to 200 or so for 5 minutes. Don't forget to turn it off after 5 minutes! Remove the cookies from the oven, and from the trays, and place in an airtight container, stacked between sheets of wax paper. Serve when ready (if you can keep folks from serving themselves).